golden bird knits: It's Official: Knits for Weddings Are In! This is a guest post from writer Eve Bennett, who resides in the UK. Who would have thought that you could get away with knitwear as part of your wedding outfit? If current fashion trends are anything to go by, it’s all the rage and whilst some of the ideas may prove more popular than others, its proof that as part of your big day, it is possible to include beautiful knitted garments that are stylish and fashionable too. Perhaps one of the main trendsetters for this particular fashion theme is the Duchess of Cambridge, seen sporting a white angora bolero for the evening of her wedding reception. It was teamed with an expensive Alexander McQueen gown, but it just shows how something so lovingly crafted can have just as stunning an effect as the gown itself. In contrast to the Duchess of Cambridge, many other brides are choosing to be more daring in their choice of knit. 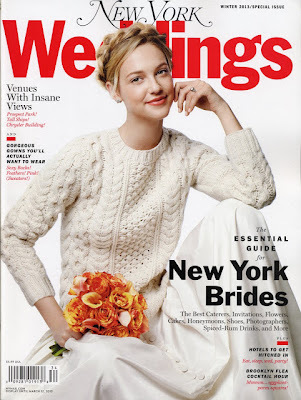 The cover of the Winter 2012 edition of New York Weddings magazine shows the model teaming a wedding dress with a white chunky knit cable sweater. The jury is, for some, out on this particular look, but for the more fashion-forward a solid, neutral colored aran cardigan might be just the contrast for you with the soft lines of a wedding dress. However, a perhaps more wearable look is that of teaming a wedding gown with a button cardigan or knitted jumper in white or a pastel color. A story was reported in the British press of a young woman who was inventive enough to knit her own wedding dress, saving herself an immense sum of money in the process and actually creating a gown that was individual, unique and quite beautiful. Save money, keep everything safe. For many people these days, the mounting cost of a wedding and making sure everything from the venue to the wedding gifts are protected with a good insurance policy can be something that poses many additional worries. For this reason, many brides are choosing to turn to handicrafts and making their own accessories for their impending nuptials as it is considerably less costly to insure a lovingly handmade knitted garment than it is an expensive wedding gown that will only ever be worn once and put away! The added benefits of making your own clothes and accessories also mean that they can be passed down to subsequent generations, who will each have their own stories to tell about the items. Then why not think about opting for something along the lines of a delicate knitted or crocheted cloche hat to accompany what you’re wearing. 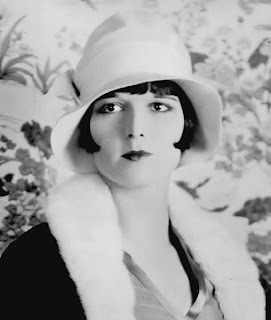 With the imminent release of the remake of The Great Gatsby coming just in time for many spring and summer weddings, this kind of headwear, made famous during the 1920s can be a complete change from a head-dress, tiara or fascinator and can really ring the changes and set you apart from all the other brides this year.